Jjuuko Paul, a Bahá'í who led the writer on a tour of the magnificient temple and gardens. 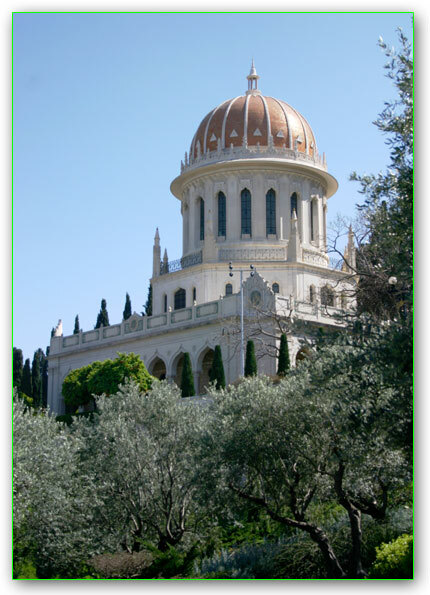 The Bahai Temple: Where nature, faith and artistic beauty reign. It has been hailed as one of the wonders of not only Uganda, but of Africa as a whole. 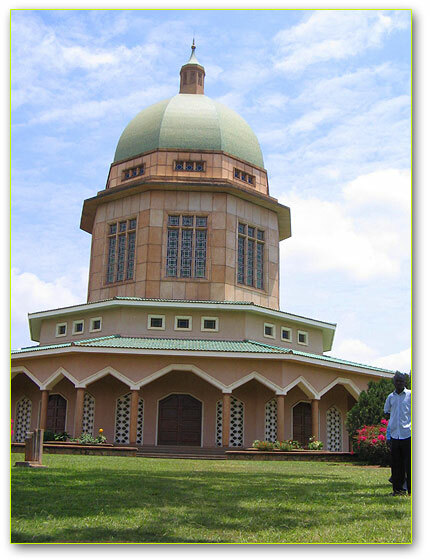 The Bahá'í Temple, about 7 kilometers from Kampala city center has awed and amazed many visitors not only because of its architectural splendor, but also because of the beautiful natural environment in which it majestically stands. 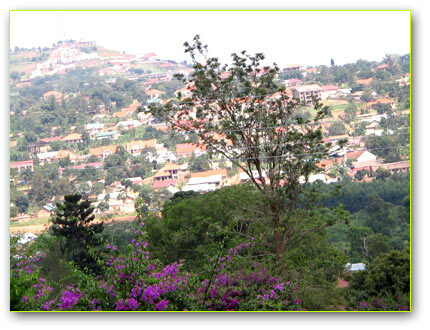 Perched at the top of Kikaya hill, it can be seen from any of Kampala's hills and many of the city's suburbs, as if beckoning people to come over and explore it. The Bahá'í Temple on Kikaya hill. Measuring over 130 feet high with a pointed tip at the very top, the Bahá'í Temple (also called the Bahá'í House of Worship) exudes a regal magnificent presence that you would easily think that it was naturally placed here at the beginning of the universe. The multi-colored octagonal glass planes which make up most of the over 100meter diameter giant building, with the brownish blue and chocolate ceramics on the floor and the rest of the walls mix with the green roofing to provide an image that seems natural in the green and multi-colored flowers that surround the Bahá'í Temple. James Shimenya, one of the Guards/ guides at the Bahá'í Temple. There are Bahá'í guards, in light blue tops and navy blue trousers for males, and skirts for females, to guide you on your maiden visit at the Bahá'í center, whether you have come as a tourist, for a family picnic, or a casual visit. Seeing as the Bahá'í temple is so exquisitely constructed, the urge to enter and discover what it is like inside is irresistible. The inside of the Bahá'í Temple is even grander than the outside. It is the lighting from the multi colored huge glass planes windows that, at the first and second level of the temple, give one the aura of exceptional importance. Then there is the dome anchored by the raised walls that can easily be mistaken for a storied building when seen from outside the temple. The dome, with its walls of lace-like tiles rising over 124 feet high and 44 feet diameter offers a scene of unsurpassed artistic beauty in any language you may like to talk about it. The spacing between the walls diminishes from the ground before meeting at the top of the building, which according to John Robert Okiror, the Secretary of the National Spiritual Assembly (NSA), the national governing body of the Bahá'í signifies unity- the central message and belief of the Bahá'í faith. There are three smartly assembled rows of wooden pews facing one side of the circular temple. The serenity and cleanliness inside make you feel like you are in God's prime presence. There is no podium/higher platform for the preachers like in many worship centers. Most of the floor is covered with woolen carpets, from the spaces at the back towards the walls of the circular temple, to the rows between the pews. From the outside it can be seen that the temple is made up of nine carved sides, with each side having a door. All the doors are made of splendidly carved wood that appears heavy. John Roberts Okiror, Secretary of the Bahá'í National Spiritual Assembly. Each side is supported by one big pillar and three pillars to ensure that the temple building is stable and can withstand any wind or forces. Okiror said the temple was built 10 feet underground in order to protect it from earthquakes common in this part of the world. 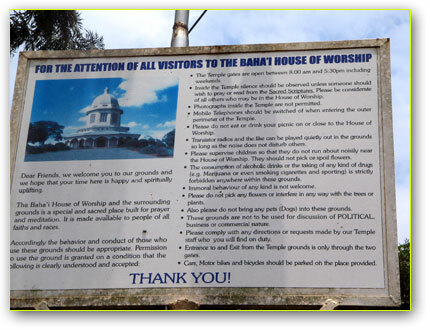 According the guides, since God is the "glorious of all glory", no pictures or statues are permitted inside "His house". A reading written in Arabic that translates to "All glory of all glorious" can be made out on the plain creamy wall in each of the nine sections. The interior woodwork and colored glass windows create a vibrant hall of ambers, blues, greens and whites that dictate the temple's extraordinary being. When the nine large entrance doors are opened, the interior appears to merge with the sun-drenched fields, and the blue and white sky dropping in from the outside- a reminder of the oneness of God's creation that is central to the Bahá'í faith. "Bahá'í faith is an independent religion on its own like Christianity, Judaism and Islam. Our faith was started by a messenger of God called Bahá'u'lláh," says Okiror. Bahá'u'lláh means "Glory of God". The believers in Bahá'u'lláh are called Bahá'ís. Bahá'u'lláh who was born in Tehran, Iran and lived from 1817 to 1892, is regarded by the Bahá'ís as the most recent in the line of messengers of God that stretches back beyond recorded time and includes Abraham, Krishna, Moses, Zoroaster, Buddha, Jesus Christ, Mohammed, the Báb and then Bahá'u'lláh. "Bahá'u'lláh was prophesized by other religions differently in the Bible, the Koran and the Buddhists. We believe Bahá'u'lláh is the second coming of Jesus," Okiror declares. Over a century ago, and for the first time in the history of revealed religion, Bahá'u'lláh, prophet founder of the Bahá'í faith, proclaimed the equality of man and woman. He did not leave his pronouncement as an ideal or pious hope but wove it, as a basic factor, into his social order. He supported it by laws requiring the same standard of education for women as for men, and equality of rights in society. Equality of sexes is, for the Bahá'ís, a spiritual and moral standard essential for the unification of the planet and the unfolding of world order. The faith emphasizes independent investigation of truth. They believe that without the qualities, talents, and skills of both women and men, full economic and social development of the planet becomes impossible. and the establishment of a world federal system, based on collective security and the oneness of humanity. Bahá'ís around the world express their commitment to these principles chiefly through individual and community transformation, including the large number of small-scale, grassroots-based social and economic development projects that Bahá'í communities have launched in recent years. "Here in Uganda, we have an office of External and Public affairs in Ntinda. 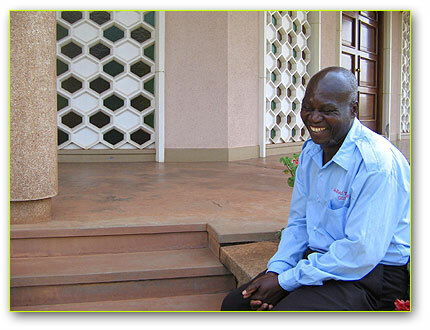 It is headed by George Olinga and it coordinator Bahá'í efforts in issued to do with promoting gender equality, human rights, peace and security so that all people can live together in unity," says Jjuuko Paul, who was encouraged to join Bahá'í because of their principle of equality of all humankind. Okiror says the Bahá'í do not carry any ceremonies or even preach in their temple. As a house of worship, people come to read or sing the sacred word. "Any function must be held outside. Whether it is prayers or even marriages. After the reading, the marriage ceremony or the prayers are conducted outside the temple," reveals Okiror. He says the absence of priests and a pulpit, reiterates the need for equality within mankind, another of Bahá'ís cardinal principles. Okiror says anyone from the congregation can lead prayers. Readings from Holy Books, (Hindu, Christianity, Jewish, Zoroastrian, Buddhist, Islam and Bábi) are used during prayers and meditation. "We believe this is the era of reason. All people can lead prayers. Unlike in other religions, prayers do not have to fail because the pastor or priest is not around. We believe matters of faith should be as participatory as possible," Okiror emphasizes. 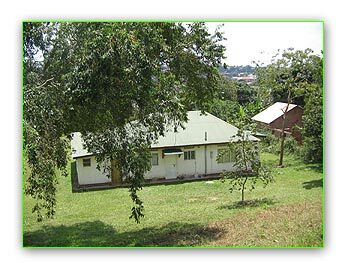 During the 1950s, a group of Bahá'ís came to preach in Uganda and there was what the Bahá'ís call a "massive conversion". 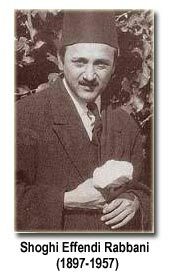 Many Ugandans accepted the Bahá'í faith and "the Guardian", Shoghi Effendi (1897-1957), leader of Bahá'í faith worldwide, called Uganda "the spiritual heart of Africa". He decided that they build "the mother Temple of Africa" in Uganda. Every continent has one temple, with the head temple in Haifa, Israel. The Bahá'í World Centre in Haifa, Israel. 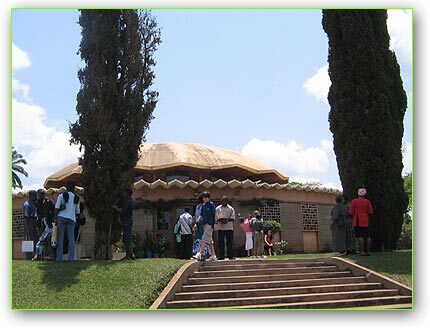 According to Okiror, Bahá'ís from all African countries contribute to the maintenance of this temple as their house of worship. The Bahá'í Temple is an architectural masterpiece, and an assembling of committed efforts of many people from different countries. The green dome at the Kampala Bahá'í Temple is made of fixed mosaic tiles from Italy, while the lower roof tiles are from Belgium. According to an official description of the Bahá'í Temple, the walls of the temple are of pre-cast stone quarried in Uganda. The steel and window frames and fittings are from Britain. The colored glass was brought from Germany. The timber used for making the doors and benches was from Uganda. 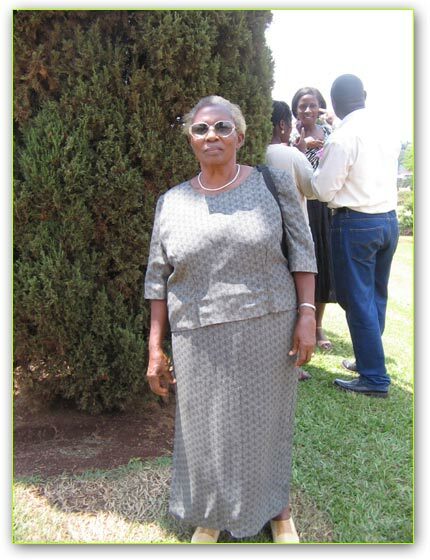 Mrs. Edith Ssenoga, a Bahá'ís who lives at the bottom of Kikaya hill was there when the construction begun. Mrs. Edith Ssenoga saw the Bahai Temple being built and launched in 1962. "This used to be a forest with many snakes. We would fear to come here. The Bahá'í came and built this temple and I have seen this hill grow. I was encouraged to join the Bahá'í and I did on November 1st 1961," she said. "I was a Christian, but many questions I had in my mind were answered when I joined the Bahá'í. I know Christ more than I did then, and I love him more than I did then," says the Mrs. Ssenoga, who would not tell her actual age. She is now one of the prominent Bahá'ís. When Ultimate Media visited the Baihai Center, Mrs. Ssenoga was interpreting questions and answers from people at the center in English and Luganda during the interactive equivalent of preaching. 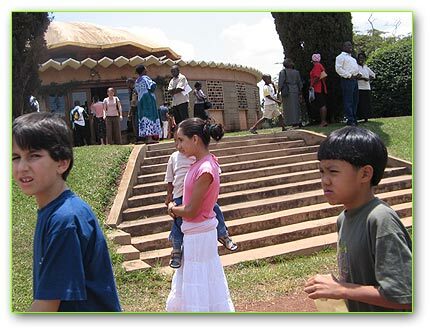 After four dedicated years of building, the Bahá'í Temple was successfully opened to the public on January 15, 1962, and has been one of Uganda's treasures ever since. While the Bahá'í Temple is no doubt a spectacular sight, it is the environment in which it is located that makes it stand out as a destination you must visit. Rows of flowers, trees and shrubs of different types grace the over 50 acres of the land on which the Bahá'í Temple is located. The trees and flowers flow down from the top of Kikaya hill to the foothill, cutting through carpet-like lawns. A closer look reveals that the columns between the flowers and trees follow the same pattern of the temple building, with each of the 9 sides (doors) having a column that leads to and from the temple to the beautiful gardens. The peace and quiet in the lush gardens can silence even the most restless souls. This is the reason this place has been a favorite for many people seeking rejuvenation. 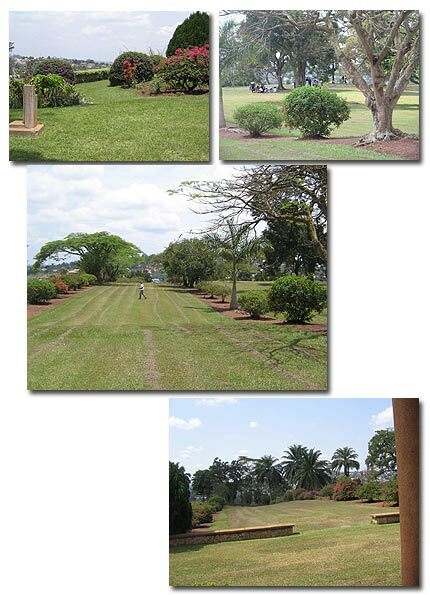 You can come here for praise and worship, a family outing, a picnic or to have a quiet time to reflect and enjoy the tree studded, well kept gardens that must be the largest and most comfortable in Uganda. Welcome poster for Bahá'í Temple. A signpost tells the essential facts and rules of visiting the Bahá'í Temple. The gardens are open to all. But while there, strict principles must be observed. Loud music, picking of flowers, immoral behavior (even being romantically intimate), drinking of alcoholic beverages and the use of intoxicating drugs are forbidden. A tour across the gardens reveals a guest house, where according to Jjuuko Paul, a Bahá'í volunteer guide, some visitors are accommodated at a fee. Most of the workers and the resident Director stay at this hill. As you enter or get out of the Bahá'í grounds, there is the Bahá'í Center, from where most of the Bahá'í activities are carried out. The building is also an imposing sight, with rolling cement like material roofing the circular building. It contains the main offices, and other rooms building around the Center's hall so that when you enter from one side, you just go around and come back to the same entrance. Some youth have also found refuge here where they come to camp for weeks. 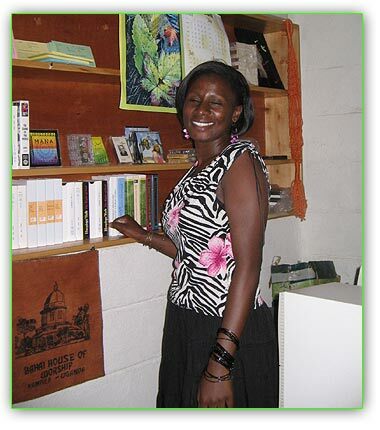 The center provides hostels when they come in organized groups during holidays for camps. During their visits they learn and interact amidst this bounty of natural and architectural beauty. Kamyokya surburb as seen from Kikaya hill from the Bahai Temple. When at the Bahá'í Centre, you have a good view of most Kampala hills. According to Allen Birungi, the Manager of the Bahá'í Publishing Trust, also found at the center, the extraordinary architecture of their buildings is meant to promote spirituality and unity of mankind. "The Bahá'í believe in achieving the best, and try to make everything the best. We strive to see how to make each day better than yesterday." 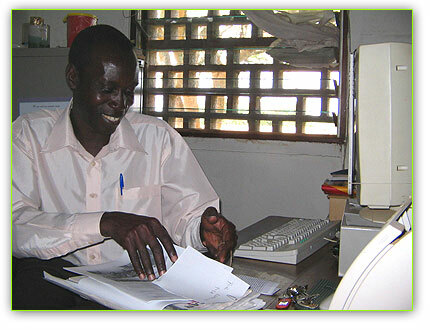 Allen Birungi, the Manager of the Bahá'í Publishing Trust. Gerald Rulekere is a Journalist and member of Ultimate Media Consult. He has written and published extensively on business and gender issues and been writing for Ultimate Media Consult (U) Ltd for the last two years. A professional and graduate journalist, Rulekere is always looking for an opportunity to better his writing especially for international media. Beverly goes to Pallisa, Uganda... known for the woman forced to breast feed dogs. Whenever you can, do pass by at Plate Cafe; my treat. Many Ugandans unfortunately may not understand the pleasure of relaxing outside the confines of a large busy hotel or a neon dotted bar and so may opt out of Eureka. Kingfisher Resort, while beautiful, has rather confusing architecture. From the dining and pool area, guests can enjoy the view of a westward oriented valley and its stunning evening sunsets over Lake Mburo National Park. UNRA faces the challenge of being dismissed as a mere change of name for Road Agency Formation Unit (RAFU).